Today we are delighted to unveil the beautiful cover for Rivals in the City by Y.S. Lee – the final book in her Agency series, out next year. Thea is a HUGE fan of the series, so we couldn’t be more thrilled to host the reveal and have Y.S. Lee over to talk about the process behind the cover creation and shoot. Mary Quinn has a lot on her mind. James Easton, her longtime love interest, wants to marry her, but despite her feelings, independent-minded Mary hesitates. Meanwhile, the Agency has asked Mary to take on a dangerous case: convicted fraudster Henry Thorold is dying in prison, and Mary must watch for the return of his estranged wife, an accomplished criminal herself who has a potentially deadly grudge against James. Finally, a Chinese prizefighter has arrived in town, and Mary can’t shake the feeling that he is somehow familiar. With the stakes higher than ever, can Mary balance family secrets, conflicting loyalties, and professional expertise to bring a criminal to justice and find her own happiness? You’d think that with the fourth book in a mystery series, the cover art might start to feel predictable. Not so in this case, to my everlasting glee and gratitude! Each of the Agency’s covers has been a model of integrity, lavish care, and historical authenticity on the part of Candlewick Press designers. This continues to be the case with Rivals in the City, the last book in the Agency quartet. Integrity: each cover features the protagonist, Mary Quinn. To represent her properly, Candlewick’s designer, Caroline Lawrence, looked specifically for a model whose ancestry accurately reflects Mary’s own racial mixture. (Are you wondering how this maps onto the Bloomsbury cover-whitewashing scandal of 2010? The first title in my series, A Spy in the House, was published in spring 2010 and Candlewick chose our model in summer 2009, a year before the blogger-led backlash over Bloomsbury’s whitewashed covers.) Long before bloggers and readers declared that they wanted to see people of color on book covers, Candlewick was making it happen. Lavish care: after choosing our model, Candlewick organized a photo shoot in New York. The covers for the third and fourth Agency titles, The Traitor in the Tunnel and Rivals in the City, were photographed at the same time. After all, it had been two years since the original cover shoot (for the first two titles, A Spy in the House and The Body at the Tower) and Candlewick wanted to make sure our model still looked young enough to be a plausible Mary Quinn. Mary ages two years over the course of the series, but fashion models are enough like the rest of us to be subject to real time! After this, the image of Mary Quinn was superimposed on a stock photo of London. Rivals in the City includes scenes at the British Museum, so this is the backdrop we see on its cover. Specifically, it’s sunset in the Museum’s famous courtyard. I couldn’t think of a better setting for the conclusion of a series that reflects on questions of power and empire in Victorian England. 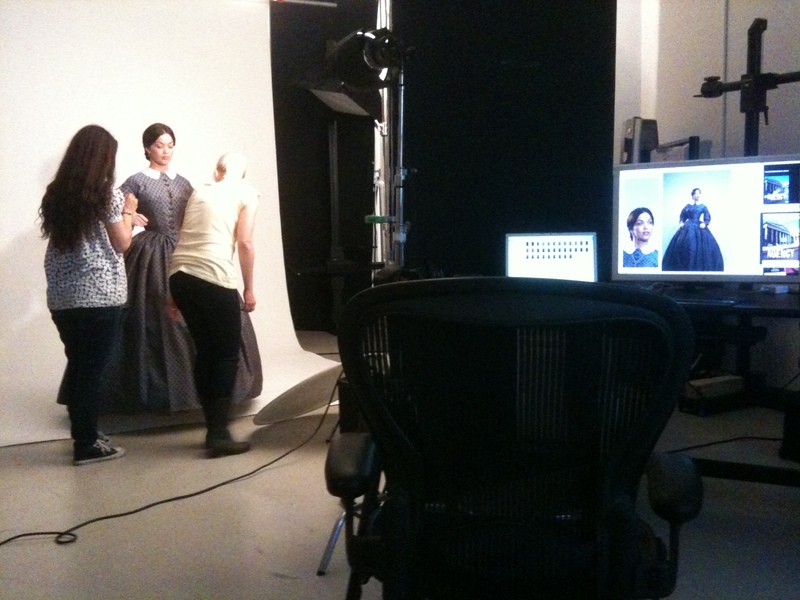 Historical authenticity: for both photo shoots, Candlewick found a stylist, Crystal Thompson, who’s an authority on nineteenth-century fashion. From the undergarments to the final details, Mary Quinn’s costumes are true to the period 1858-1860, and they accurately reflect her various disguises in the novels. 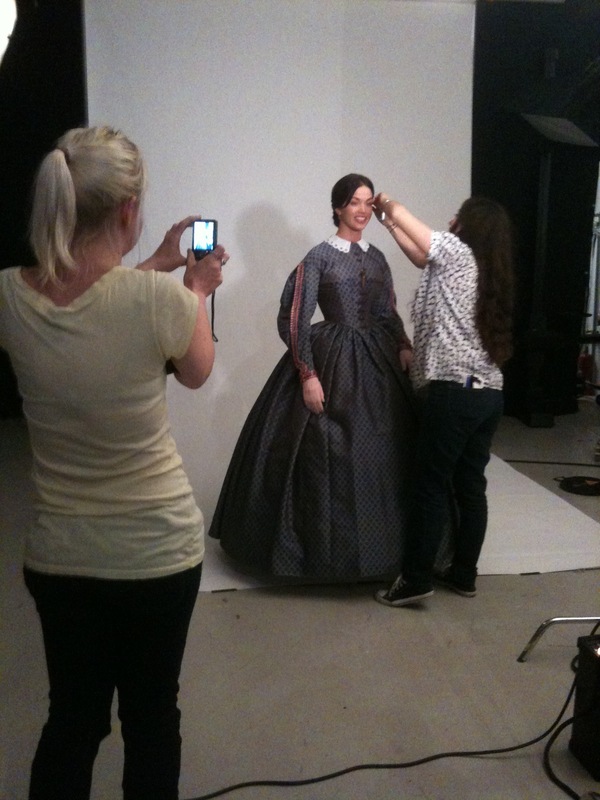 To give one example: on all the covers, Mary’s dresses button up at the front. This is because a girl like Mary wouldn’t have a maid to help her dress; unlike an upper-class lady, she must be able to fasten her own buttons. Integrity, care, and attention to historical detail are critical. After all, a cover is supposed to encapsulate a book’s themes, to convey them in a single image. But I’m also staggered, each time, by the beauty of these covers. I absolutely love them. I hope you do, too. Y.S. 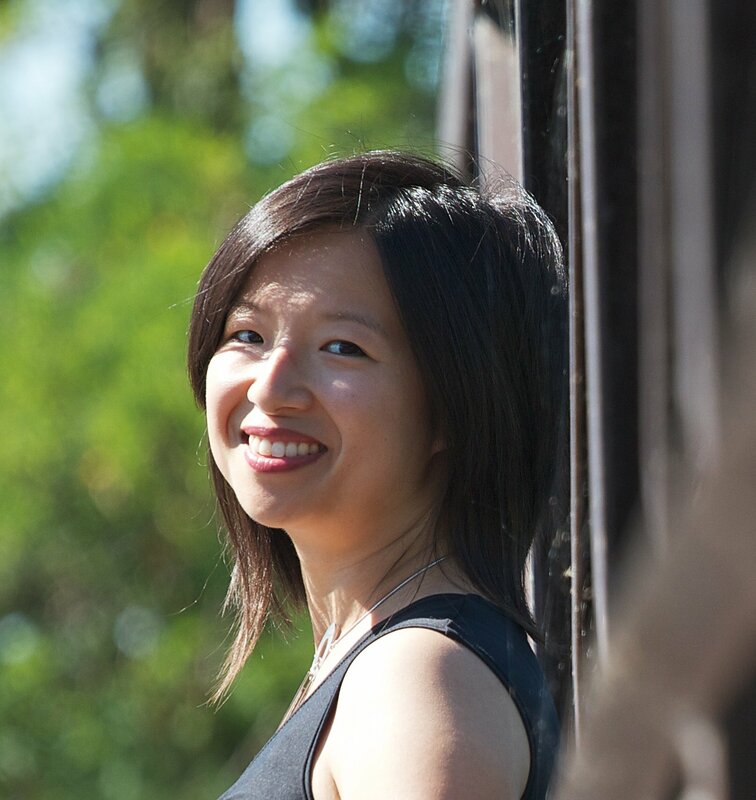 Lee was born in Singapore, raised in Vancouver and Toronto, and lived for a spell in England. As she completed her PhD in Victorian literature and culture, she began to research a story about a girl detective in 1850s London. The result was her debut novel, The Agency: A Spy in the House. This won the Canadian Children’s Book Centre’s inaugural John Spray Mystery Award in 2011. You can read more about Y.S. Lee on her website or check her out on Facebook and on Twitter. Thanks to the publisher, we have seven copies of Rivals in the City up for grabs! The sweepstakes is open to addresses in the United States and Canada only, and will run until Sunday, September 28 at 12:01am EST. To enter, use the form below! Good luck! Omigosh I am beyond excited for this book. Thank you for the giveaway! My favorite historical novel (apart from The Agency series, that is) Under the Jolly Roger, Being an Account of the Further Nautical Adventures of Jacky Faber, by L.A. Meyer (may he rest in peace). I think it might actually be the entirety of The Agency series. Though Stephanie Burgis’s Kat Rengency era and Gail Carriger’s The Finishing School series are both quite brilliant. But all the others I like tend to stream off into alternate realities with Steampunk, maigic, or dragons. Oh, yay, I’m glad there’s going to be another book! And the cover is lovely. 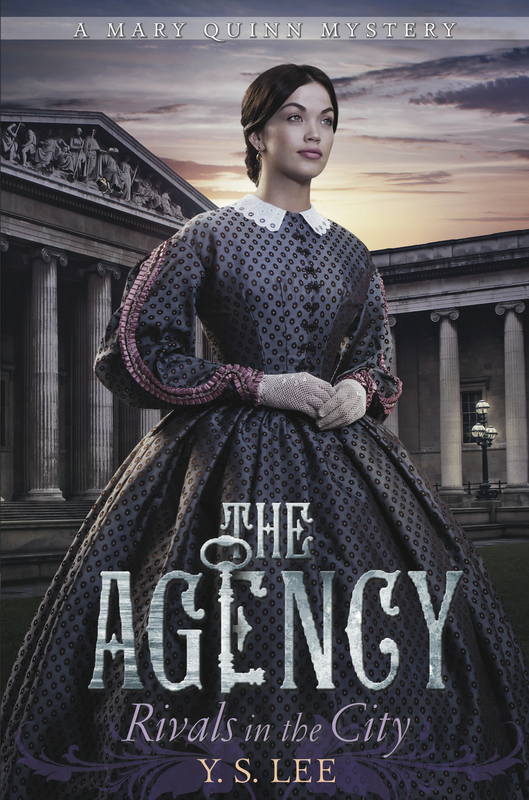 As a Victorianist, I would have to say the books in the Agency series are my favourite YA historicals. Accurate with an awesome feminist twist. My catnip. I might have to go with the Kat books by Stephanie Burgis. They’re a lot of fun and feature a very memorable protagonist. I have not read a ton of YA recently, but I really enjoyed listening to Grave Mercy by Robin LaFevers. That is a trilogy I would love to finish one of these days. For historical YA fiction, I’m torn between the “Agency” series, “Codename: Verity”. For historical YA paranormal, I really enjoyed the “Dark Mirror” series. The first historical YA that comes to mind that I LOVED was Code Name Verity, but the first historical fiction novel (not necessarily YA) that I read as a teen and adored was “Trinity” by Leon Uris. I AM SO SO EXCITED FOR THIS!!! My favorite historical YA would be Code Name Verity because of the amount of tears it made me cry. I love how the covers are accurate in terms of race and in terms of period clothing. The detail about the front buttoned dresses?! Amazing. Re: favourite historical books, I honestly look to these books when I talk about great historical YA. I also love the River of Time series by Lisa Bergren — it’s time travel, so the heroine is contemporary, but it takes place in medieval (I believe) Italy. A Mad, Wicked Folly by Sharon Biggs Waller is another great book which involves art and women’s suffrage. The first ones I can think of that I loved are the Grave Mercy series and Code Name Verity. My favorite historical YA novel is The Body at the Tower (The Agency Series #2)!!! I love how it’s a whole series showing a girl can do anything a guy can and in such a historic time as Victorian England!! What a fascinating story. Amazing how much work goes into the making of each cover. So cool to see behind the scenes for cover design. So excited to the next Mary Quinn book! Omg The Agency is probably one of my favorite series ever written and I thought it had ended after the 3rd one so I’m crazy glad that this new one is coming out and I can’t wait to read it! And the cover is gorgeous so even better! I really enjoyed Jennifer Donnelly’s Revolution. I love the Agency series! Favorite YA histoical fiction: probably Code Name Verity by Elizabeth Wein. Ooh, thanks so much for such an awesome giveaway! I love reading behind-the-scenes stuff! I’m gonna go old school and say the Ruby in the Smoke 😉 Thanks for sharing! Mary Quinn Mystery’s, I think it’s the only historical fiction I’ve ever liked. I did really love Code Name Verity and I’m so happy there is another book in this series! I’ve been anxious for news of this book. For some old favorites, I love anything by Karen Cushman, especially Catherine Called Birdy. She does historical like nobody’s business! GAH! The cover for the forth and finale book (*sniff*) is gorgeous. I love how much care and consideration is put into the design and authenticity. My mom and I both enjoyed the first three books- I can’t wait to find out what happens next! Thanks for hosting this giveaway! The Agency series is definitely up there as a favourite! But I’m also a huge fan of the His Fair Assassin trilogy. I am such a tremendous fan of these books. I can’t wait to read the fourth!! I loved the Agency series, and I’m so excited about the fourth book! Mary Quinn is such a great character. I have to add my voice to Code Name Verity and Rose Under Fire, as favourite books of any category that happen to be historical fiction. I don’t read a lot of historical fiction, actually. Does Connie Willis’s Doomsday book count? It’s a time travel novel but most of it takes place in the middle ages. Not YA, either, but that’s what I’m going to add to the list. I love love love the Agency series, and I’m so glad there’s going to be another one! As far as other historical ya goes, I also love The Diviners and A Great and Terrible Beauty, both by Libba Bray. Very excited that there is a fourth book. Thought it was completed with three! I really don’t know which is my favorite, but The Agency series is high on the list! I think mine would have to be The Winter Prince. Arthurian legend and history of that time period in one amazing package. Currently my faves include The Oversight and The Scandalous Sisterhood of Prickwood Place. I’m getting too old. I can’t remember the authors or whether I got that second title correct. Sigh. I loved the Gemma Doyle series by Libba Bray!! I love Victoria McKernan’s historical fiction. My all-time favorite is the Gemma Doyle trilogy by Libba Bray! I keep finding myself re-reading the books time and time again. Also, I love how Candlewick was so meticulous in creating the cover for Rivals in the City, both in choosing the model and the clothes. Loving the behind the scene photos as well! I ADORE historical fiction, and though it’s a tough choice if I force myself to not count historical fantasy options I choose Scarlet by A.C. Gaughen. Love this series! Thank you so much for sharing the cover story with us. Almost forgot to pick a favorite historical YA novel.It’s so hard to pick just one! I’ll go with Song for a Dark Queen by Rosemary Sutcliff. My favourite historical YA novel would probably have to be Code Name Verity by Elizabeth Wein. (In a few minutes I will have probably thought of a different book I should have used, there are just so many good historical YA novels) Anyways, Y.S. Lee, you must be so excited to see the Canada/USA release of your novel! Congratulations, and I am looking forwards to your other books you are writing! I really liked The Mists of Avalon. Thanks for having the giveaway. I love these covers! And I love all the detail and work Candlewick put into creating them. So very cool! Oh and I gotta say my favorite historical novel has to be either Sarah Plain and Tall or Anne of Green Gables.